one humbucking pickup, one volume knob and a single switch. 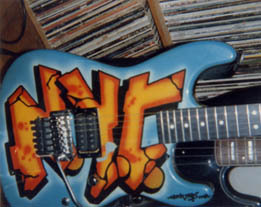 Metallic gun metal green body with NYC Graffiti painted on a blue background across the front. It was routed for a Kahler tremolo so there is a cutaway hole under the tremolo bridge..
On the evening of 6/25/87 Mark's Charvel Strat guitar was stolen from his dressing room after a sesssion at the "Cat Club" located on 13th Street & Broadway in New York City. It is one of Mark's favorite guitars, he was devastated when it was taken. A reward is being offered! To anyone who has any information that can help us in locating and retrieving his stolen guitar.